Supporting pregnancy from fertility to postpartum. Specialized care for the littlest people in your life. Caring for the whole family! 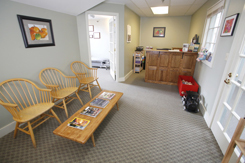 Welcome to Pinetree Family Chiropractic, a chiropractic family practice located at Lower Falls Landing in Yarmouth, Maine. Overlooking the beautiful Royal River, Pinetree Family Chiropractic provides a soothing, safe, fun and caring environment for all members of your family. We also provide specialized care for pregnant and postpartum mothers, infants, and children. Pinetree Family Chiropractic is dedicated to helping patients avoid costly and invasive drugs and surgery whenever possible by providing knowledgeable and effective conservative treatments for a wide variety of conditions. Pinetree also offers wellness care to help keep you healthy all year long!